There will be plenty for the intelligence analysts to piece together as they search for clues that could lead to the identities of the perpetrators or their location. But the video � which runs to two minutes and 47 seconds � is also dripping in symbolism and imagery promoting its underlying message: Here is an organization willing to taunt the commander in chief of the world�s most powerful military with a brazen act of symbolic violence designed to strike fear into their enemies and instill a sense of invincibility among followers and potential recruits. It is a slickly produced affair, starting with a clip of President Barack Obama, then cutting to the stark desert location selected for the killing. Despite the brutality of the act, this is not footage captured by a spectator on his wobbly cellphone; it�s the carefully constructed output of a professional propaganda unit. Sotloff, like Foley before him, is shown wearing a clip-on microphone as he delivers the statement written for him by his captors condemning Obama�s foreign policy. And the IS even uses some Hollywood techniques, cutting to a blank screen as the man with the knife sets to work. what if noone watched the "Hunger Games" ? I believe ISIS uses these v�deos to recruit more extreme Islamists,that sickens me. No doubt these videos are propaganda, that is quite obvious, really. But sly? How sly is a sledgehammer? 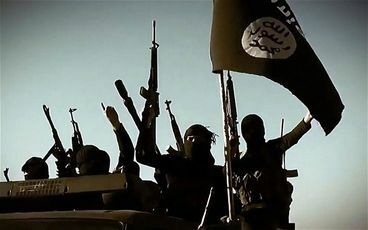 Why is the threat of ISIS in Iraq a sufficiently vital interest, but not the rise of ISIS in Syria ? The answer � may well involve the use of force on a limited but immediate basis, in both countries.